After a year of work on this costume and after 2 validations refused I am happy to present you my costume modified according to the requests of the judges. I would be very surprised if my request for validation was not successful because my costume was validated for a promotional campaign of a large brand of hypermarkets in FRANCE by the representative of the costumes of LUCASFILM (Trish) and the representatives of DISNEY in France (August 21, 2017). 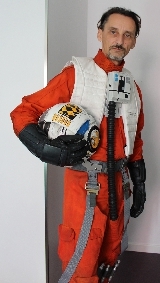 In order to meet the requirements of LUCASFILM and DISNEY my costume was aged and aranged by a movie costume designer working for the production company in charge of the films. Indeed my costume was worn by a French actor (Romain LANCRY) during several mini promotional films that will be visible from October 23 on You tube. My base commander of REBEL LEGION FRANCE gave me permission to participate in this campaign. If there is any doubt about this validation with you, I ask you to get closer to my commander who will be happy to confirm my participation in this event. I present you my modified costume. Looks great Pascal. Just finishing up mine too. Wish you success in the approval process.